Hi everyone! After yesterday’s OOTD post, I figured I’d do somewhat of a follow up post regarding my make up staples and the products I use. Of new things I’ve been trying to pursue over the last year, make up has been one of them. My mom only wore basic make up, so I wasn’t really taught on how to do my own make up, other than how to apply lipstick. I remember being in Color Guard freshmen year in high school. We had specific make up shades to buy and when I came to school for our first performance, I had no idea where to start. Luckily, my teammates were around to help. And after a while, I was able to do my basic make up by myself. Fast forward to the present, with all the contouring and high lighting in the world, I’m far away from being a make up pro. Hell, to be honest I don’t even know how to pick shades that go well on my skin. A few years ago, I even tried Ipsy. I think I was moreso excited about the cute make up bags because I was so unsure of the products. A lot of products went unused. But I’m easily influenced and seeing some of my favorite actresses and their application of make up recently, got me inspired again. Lord knows I do not wake up early enough in the morning to put on make up for work, but I do try a little harder when going out. I never used to prime my face. I had no idea what primer was used for. Then I got a sample & then I finished that sample and went on looking for another primer. I like Maybelline products, so I decided to try this one. After putting on some moisturizer, I follow with this primer. It makes my skin look smoother and brightens up my face! I’m almost running out, so I’ll have to decide if I’m going to continue with what I’m comfortable with or try something new. On the days I make an effort, I use this foundation. Prior to this, I had Maybelline’s Fit Me Foundation. I figured I’d try something new and I definitely like the coverage. I used this to conceal under my eyes mostly, but I also use it to highlight the T zone. This is obviously a darker shade than my skin tone, so I use it to try to contour my face, paired with the above concealer. When I’m not wearing liquid foundation, I go straight to the powder to look less oily and more natural. I’m pretty committed to this powder. When I have full on make up, I use it as a finish. I dislike pencil eye liner. I always find it very hard to apply and it tends to break. I’ve tried gel liner, but that was hard for me too. So I went with liquid eyeliner. I’m also very committed to this product. It glides on really smoothly and is bold! It lasts pretty long, but can smudge as I rub my eye a lot. And the bottle doesn’t dry up, like I experienced with other liquid liners. I used to use a different Maybelline mascara. I used the purple and the pink one, both of which I loved. I don’t have issues with clumping with the Maybelline mascaras. So I figured I’d try this one. I definitely like the volune I get since my eyelashes are not naturally long. And there you have it! 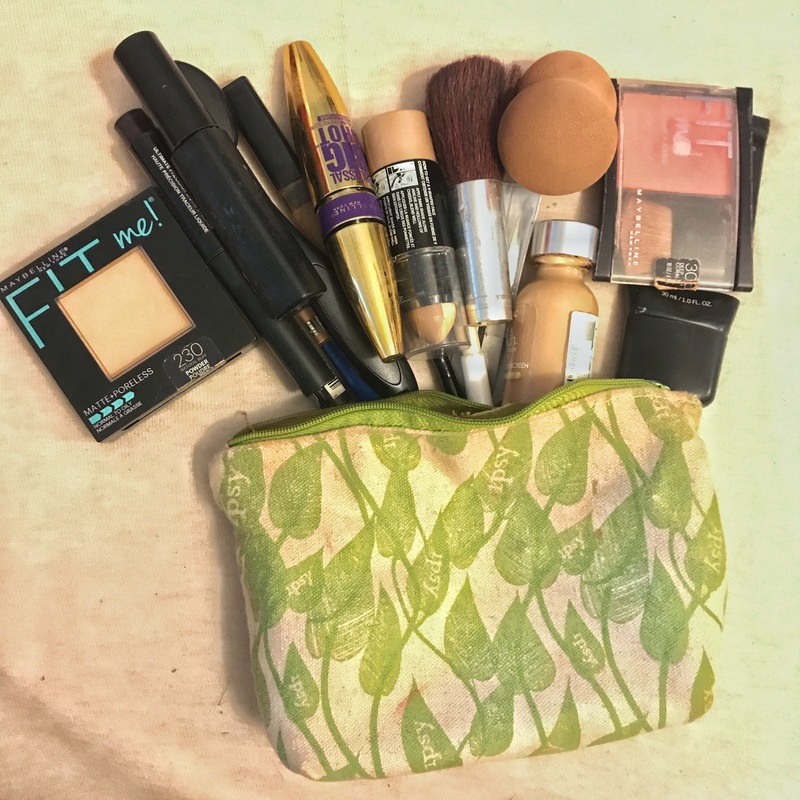 The basic products I use when I apply make up. I don’t really go for the high end make up since I don’t wear make up every day and I’m not the best at application, but I’m pretty happy with the quality of the products I do own. Clearly, I have a love for Maybelline. Why change things? What products do you use on a day to day basis? This entry was posted in A blog a day August 2017, Personal and tagged blog, challenge, lifestyle, love, make up, Personal, random on August 5, 2017 by Adele Fredeluces.